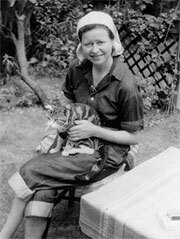 In 1952 Agnete returned to London to be with her husband Harry Bohrer. With 13 years of experience of running an art studio within industry, Agnete’s expertise and talent was quickly taken up by the Doulton Lambeth Studio, who were looking to revitalise the studio production for the home market. 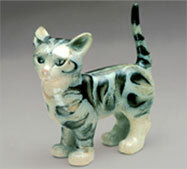 The Lambeth Studio had been in existence for over 80 years, producing salt-glazed stoneware ornamental pieces. Many well-known and respected artists had been employed by Doultons during this time, including William Rowe, Harry Simeon and Vera Huggins. Agnete’s immediate predecessor was Joan Cowper. The studio was run on similar lines to Bullers though none of the work was ever intended for mass production. Agnete brought her own distinctive style to Lambeth by reviving the traditional decorative methods of earlier studio artists, re-using them in a highly innovative and skilled way to make contemporary ceramics. 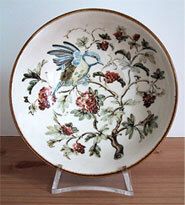 Using a cream-coloured stoneware base she painted beautiful flower, bird and fruit motifs, the whole being applied with a transparent glaze. 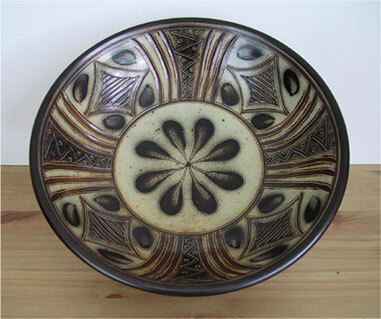 In 1953 Agnete was asked to produce a range of decorative ware to commemorate the Coronation of Queen Elizabeth 11. 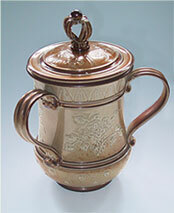 Among the items she produced were a brilliant 3-handled loving cup and a tankard. Perhaps one of her best known pieces from this period is the cat, Pushkin, which was modelled after her own cat – Alexander Pushkin. By 1956, Doultons had made the decision to consolidate their business in Stoke-on-Trent and closed the Lambeth Studio.